build installations that function as meeting places inside the Sauna Building next to Oranssi. We are very intrigued by your works. Although they are concerned with society and materiality, they seem to have something surreal, fleeting and extraterrestrial quality to them. Perhaps it is the mix and fusion of both man-made things and digital encounters, both intangible and the material, the earth and cyberspace. What is the background from where this arises? Please tell us the about the philosophical nature of your practice. Our practice is characterized by material diversity. Together with the aesthetic-conceptual fragmentality of our works, it results from the mutual disagreement that has been going on over a decade. Artworks, the by-products of this uninterrupted interaction, can be considered as collections of both interrelated and unrelated elements. From the mesh woven from intersecting monologues we have been trying to trace lines of thought that resemble old paths on the edges of wastelands. These tangled and ever-branching routes are fascinating, even though one cannot be sure of their destination. We have tried to go beyond the contemporary experience lubricated by oil by doing focal exercises. Focality has been proposed to work as a counter-practice to current fossile-fuel-driven, uniforming productivity (e.g. Energy and Experience by Antti Salminen & Tere Vadén). The prerequisites for focality (Lat. focus, fireplace) are practices and objects that require concentration, commitment, dedication and skillfullness. Like locality, focality works against alienation by building relationships and skills, and holding them together. In the exercises, making art adapts to the prevailing circumstances when we strive to work locally, at its simplest with objects and themes found from the place of residence or performance. Preparation for the world of scarcity starts with mapping the circumstances. However, in the transfer phase even the abundance of the surplus can overwhelm. Our attempt to reach out to some sort of focal ways of life and (artistic) work in the rapidly changing vortex of residencies, projects, and exhibition situations is also paradoxical in principle. To date, we have implemented focal training, or rather focal warm-up, in Catalan Pyrennees, Serbia, Scotland and Suomenlinna. Your work in the ‘Augmented Geology’ exhibition at Karst or even the ‘Geomimesis’ installation at Ars Kärsämäki are fascinating works combining found objects, biological specimens and speculative minerals. By juxtaposing the materialities of man-made found objects vs deep geology, or biology vs digital fantasy, you have been creating a unique body of work. What do you think are the common overlaps between these? And, what inspires you to try to link them, why bricolage? Firstly: bricolage (French for "DIY" or "do-it-yourself projects around the home") means the construction or creation of a work from a diverse range of things that happen to be available, or a work created by such a process. We have sometimes used bricolage as a useful concept of describing some of our practice which deals with combinations of the materials available at the site concerned. It also incorporates creative thinking and discourses. We try to avoid dualistic categorizations of the world and its phenomena. 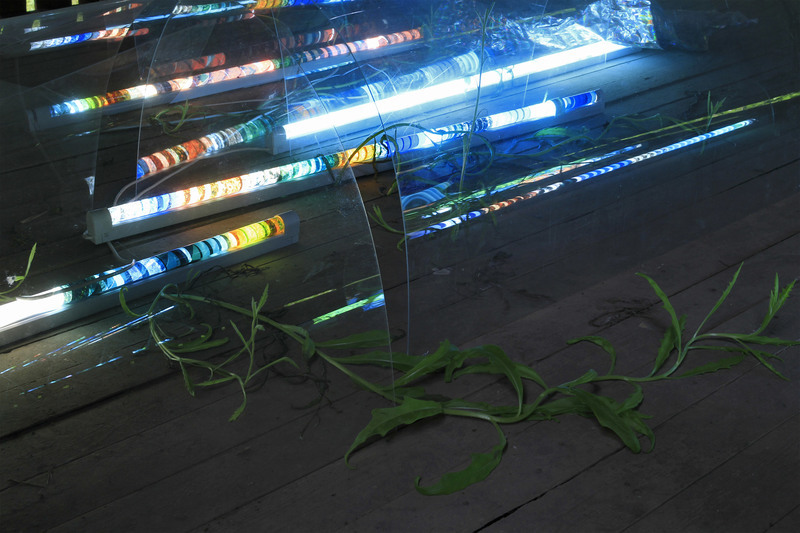 Digital fantasy may at first seem immaterial as opposed to living organisms. Animated 3D objects and still lives that make use of photogrammetry give shapes to actors that remain invisible in the mundane human perception, and get visualized with the help of machine vision. In the indefinite series of speculative minerals, the geodiversity of fantasy, in turn, is associated with the illusion that the existence connected to a digital network would somehow be immaterial. After all, we are not online nor are our files in the cloud, but everything is fundamentally bound to hardware, rare earth minerals, micro-wave radiation, the data centers of the subarctic climates. Everything's more or less interconnected and dependent on each other. 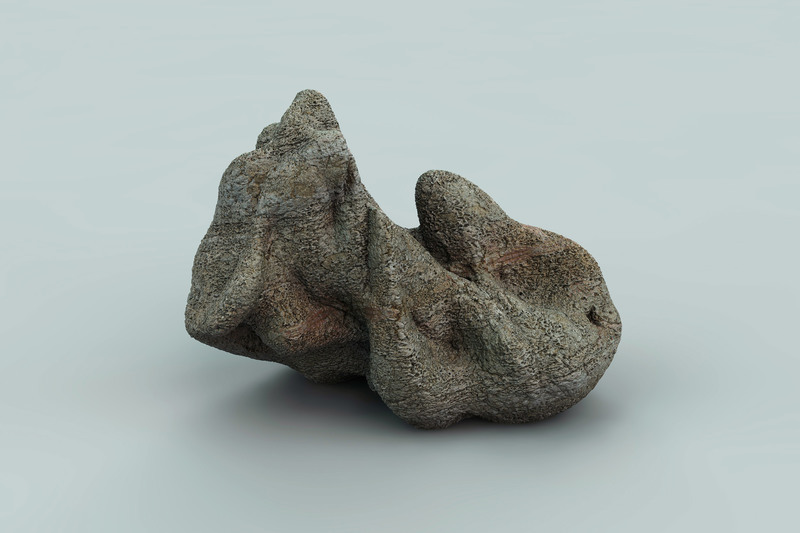 How does physical encounter and interaction between you as an artist and other things such as rocks, invertebrates or 3D models lead you to create artistic works? What do you hope to achieve through staging these encounters? We want to cultivate a diversity in our practices and thinking processes, so we try to keep our work open for different encounters, chances and coincidences. It is not by staging encounters that interaction takes place. Rather, connections and interdependencies appear anywhere, unexpectedly. For us, working and other parts of life have become somewhat inseparable. We strive for appreciating other beings and agents and also collaborating with them if necessary. It is important that we also give up control at times. There is an uncertainty, a spontaneity in your works, a sort of a live performance more than a static piece of art, yet there must be a degree of practicality and rationality to how you go about this. You simply don't arrive at the site with a truckload of shock tube detonators, floating sculptures, banners, and video files, or do you? Please tell us about your tools and methods in your art works. When it comes to practical artist ecology we're very down to earth. We scavenge materials, and with them try to articulate the current contexts or the lines of thought we're working with. Also we combine parts of our old works and other problem waste with new contexts. Although our interest towards working with scarcity initially started due to the circumstances, it can be seen as preparation for the society of decreasing resources. At the level of everyday working conditions the scarcity state of mind manifests itself mainly as the increasing lack of interest towards big productions, international promotion, white cube infrastructures, touring exhibitions, or permanent displays. The freedom of choice still very much flourishes in the material multitude of leftovers. Nevertheless, the coping strategies (that also start to feel the most enjoyable strategies for us) map the possibilities for the transition towards a scarcer but a more meaningful world. Possible approaches used are scavenging, bartering, borrowing, and all modes of self-sufficiency, including learning different crafts and skills. We prefer to work locally with local resources, and try to minimize the need for art transportation and preservation. This exploration is yet only in its beginning. Most of your works and projects are temporary, use in-situ materials and localized. In a sense they have a gritty and ephemeral quality to them dependent on the locale and conditions. You say that you are at the mercy of the space and conditions of the site of your work. Where do you even begin? 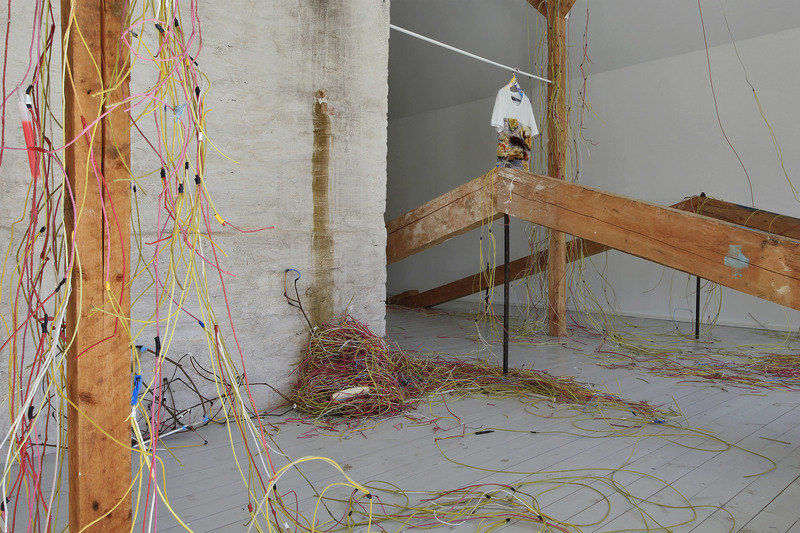 Do you think the context of an experimental arts festival such as Pixelache and the post-industrial neighbourhood of Suvilahti, Helsinki offer you any possibilities of exploring a different angle to your artistic practice? We hope so, and look forward to working both in the context of Pixelache and Suvilahti! However, we have grown to appreciate slowness more and more when it comes to thinking and other practices, such as living with the materials one is working with. That's why it's getting increasingly challenging always to be thrown into a new setting and situation. Improvisation is often fun and can lead to great results, but failure is also essential part of the process. Hopefully we can maintain a balance of sorts between these two. If anything, we come to Suvilahti with our presuppositions and expect to start disagreeing. That's how things usually get started. - Thinking of Invertebrates | 2017, detail view of an installation, Mustarinda, FI. Shock tube detonators beachcombed from the bays of the Suomenlinna Island placed in old nail holes and in the tunnels of the larvae of violet tanbark beetle (Callidium violaceum); a rya rug depicting a fur beetle larvae (Attagenus woodroffei) feeding on oat flakes; a styrofoam wall with an unfinished copy of Donna Haraway's article published in e-flux in September 2016; Kuvarica, an adaptation of traditional Serbian embroidery craft; 3D animation, HD, duration 30 min 16 s; plywood boards found from the storage; adjustable clamps. - Transition Zone | 2016, 243 digital minerals. - Explanations of The World: Geomimesis | 2016, detail view of an installation, Ars Kärsämäki, FI. Heavy traffic of highway 4, small scale greenhouses, creeping thistles, platonic solids, core samples, grafted biopolymers, hologram plastic sheets found from the attic, speculative minerals, peruvian organic banana peels.